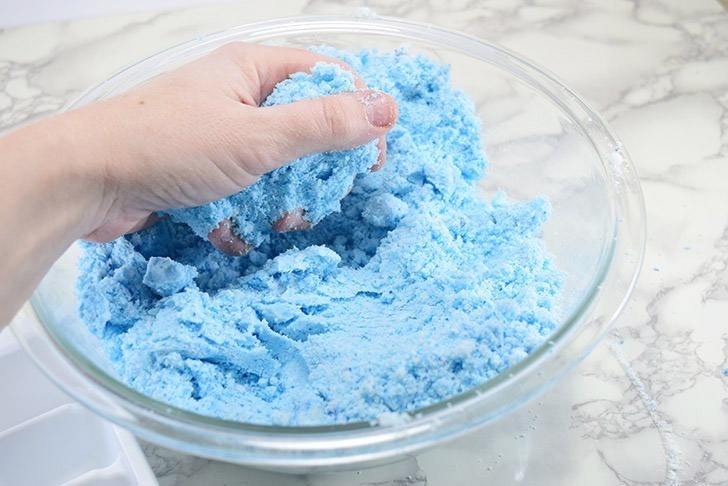 Your sense of smell is pretty much gone, which makes for a better time cleaning out the litter box but gives you a sad face when you can’t smell one of the greatest smells in the world of cookies baking in the oven. I can go through my day a bit miserable but I still get business done. But when I lay my head on my pillow to try and sleep I start to wig out when I am almost out and in my sleepy haze try to draw in a breath through my nose and it doesn’t happen. I instantly pop straight up and wig out because I can be alarmist and so I am perfectly aware that what has just occurred is that someone definitely just tried to smother me with a pillow. One of the only ways I have found to help myself is with an aromatherapy session heavy on the eucalyptus or menthol. Now I used to buy these fizzy jobbies at the pharmacy but in the past few years I have felt like they just haven’t been as strong as they were in the past meaning that they also don’t help nearly enough to warrant the cost. 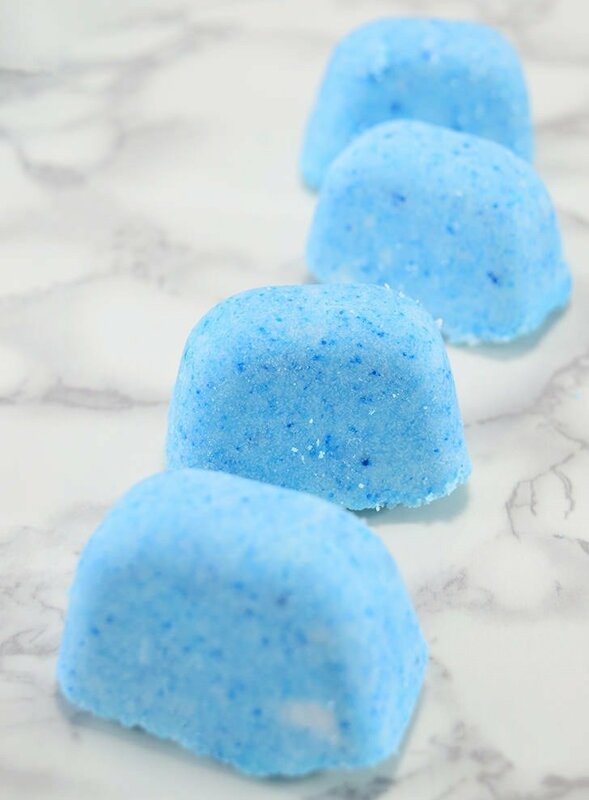 After a restless night the next morning I decided to make my own congestion clearing shower tablets because, I already has most of the stuff. Now the only thing that I did not have was menthol, which is purchasable as crystals. See that business up there? Those crystals in my hard is pure menthol. Isn’t it cool looking? The first time I saw it I was totally interested in it. 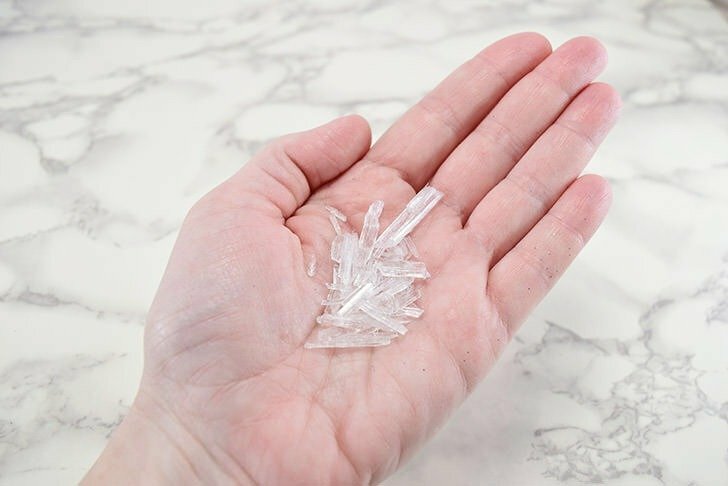 After a bit of research I found that natural menthol that is an oil from mint plants that is frozen which forms crystals. I also tried to read up on how the synthetic was made but I don’t science well enough for that business. In honesty I’m not sure if the link to the menthol that I purchased and used is synthetic or natural but I can tell you that it works really, really well. Now it’s not a great idea to touch this stuff with your hands because if you rub your eyes it will HURT. But I ran out of gloves and I figured that I could be smarter than all that. But apparently I’m not. And my punishment for my stupidity really, really hurt. 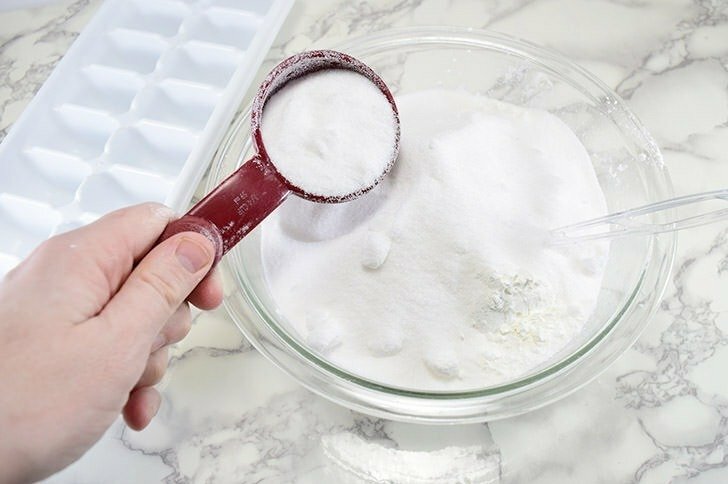 Once all dry ingredients are together mix as well as you can. Next we are going to add eucalyptus oil which is amazing at helping with congestion. 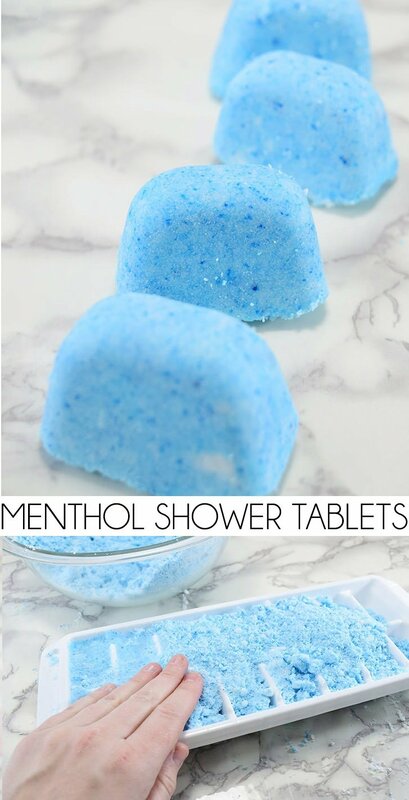 If you don’t want to go to the trouble of purchasing menthol crystals you can add more eucalyptus oil with similar results. I do prefer the addition of menthol as I feel it works better for me. 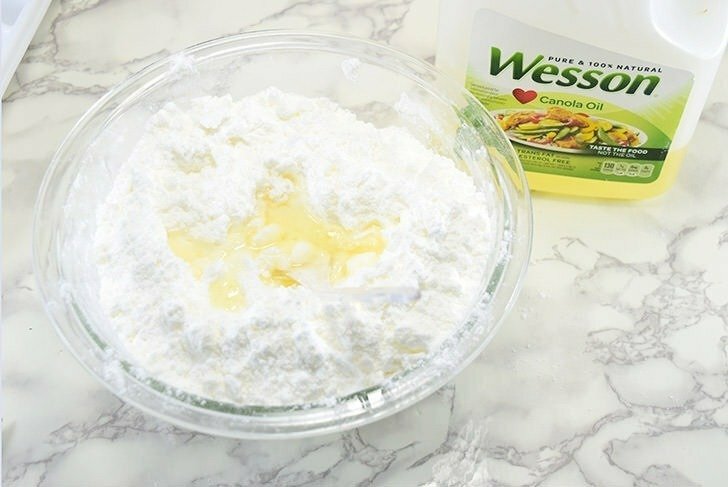 To get a very strong aroma I used 2 full tablespoons which is equivalent to about an ounce. You can purchase big bottles of eucalyptus oil online making this portion more affordable. I ran out and got this 2 ounce bottle at Walmart for $2.50 which is actually a really good deal. Add a few drops of food coloring to the oil, if you wish, and then mix everything up really, really well. The food coloring truly not necessary as I’m sure when you feel like poo run over by train you’re not going to give a fig about what color it is sitting near your feet in the shower. In all honesty I added it so it would photograph for this tutorial better. Now if you already have a lot of the ingredients to make these on hand. First up if you pack the ice cube tray totally full, like I did here, you’re wasting a decent amount of your stuff and that stinks. Rather than packing it all the way to the edge, just fill in each cube section. 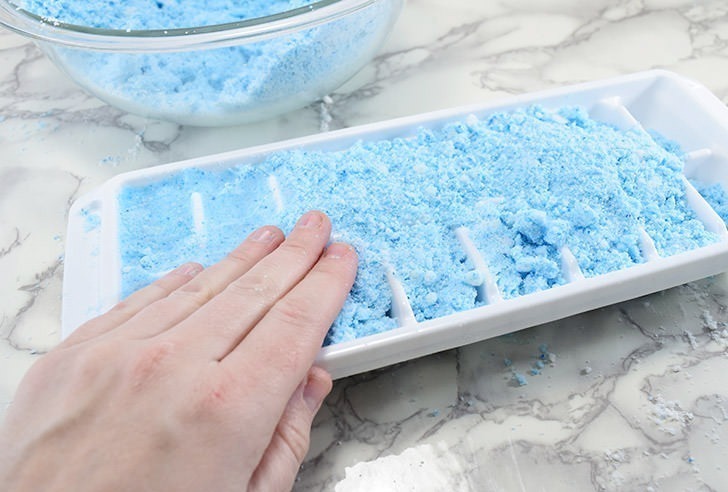 When I couldn’t find an ice cube tray (okay I was tired and feeling lazy and didn’t want to walk to the kitchen) one time I used a silicone soap mold instead. 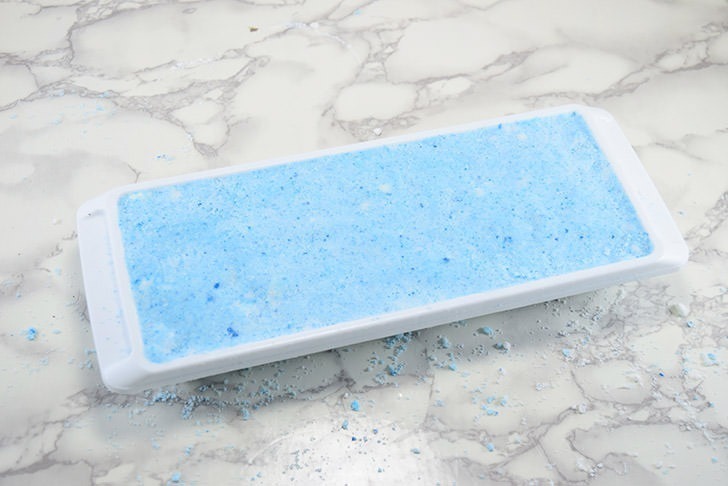 That was AGES ago and that darn soap mold STILL smells like menthol and eucalyptus making it pretty much unusable for me. 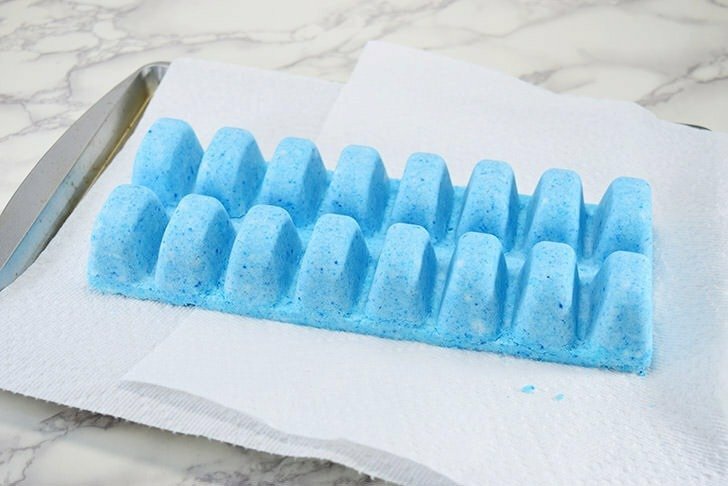 Ice cube trays are super cheap and create an absolutely perfectly sized shower bomb that last me between 20-30 minutes. 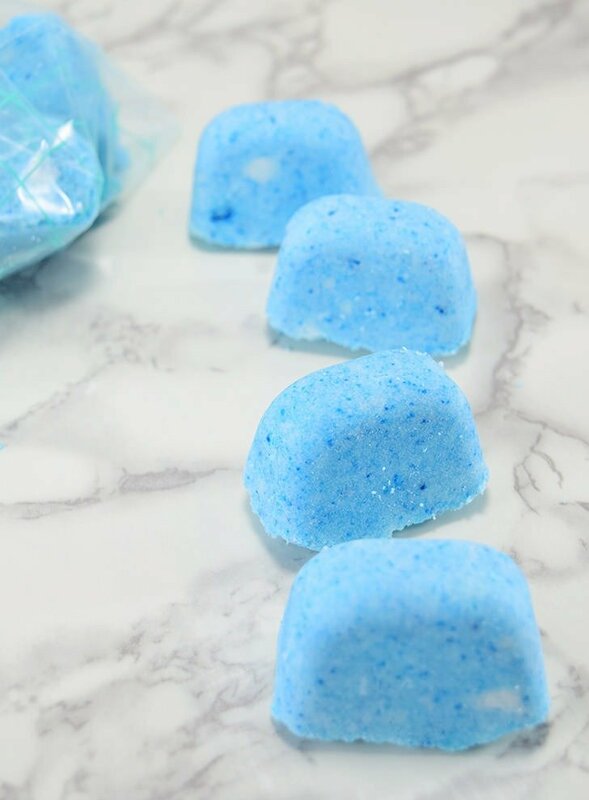 Allow your shower soothers to set up, at least 24 hours, though a few days is always better. With time they will harden and form very, sturdy little guys. Now see where I filled the mold completely? The entire thing popped out well, but see the second one in from the left on the back? See that little bitty crack on that cube? That is where every cube will separate meaning you wasted quite bit of you business. And the pieces left behind are too little to really do much good in the shower because they melt away way too quickly. You can store these guys in a gallon sized zipper bag to keep and they will keep really well. 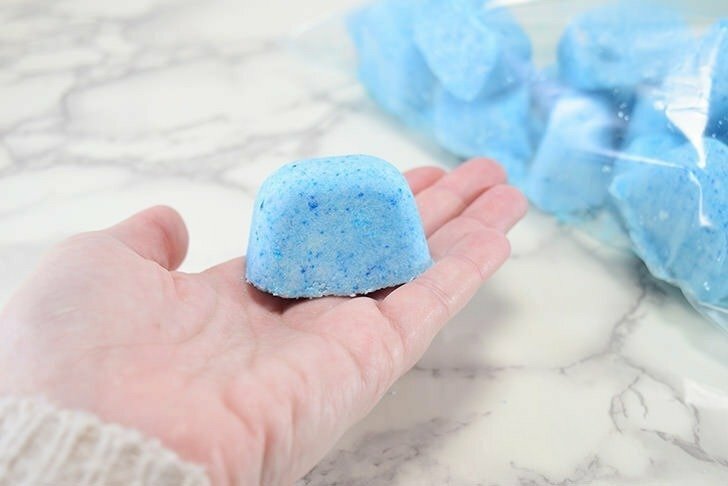 To use simply place the menthol shower bomb on the floor near the shower stream but not directly under the full force. You want it so that water sort of sprinkles onto the bomb. This will help the bomb last longer which is very helpful in allowing it to give off the congesting busting scent for more time. 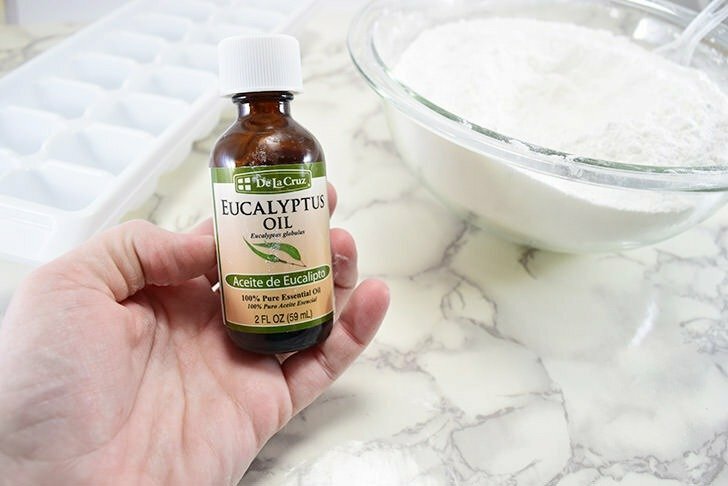 I’d suggest making a smaller batch the first time or 2 to make sure that you get enough out the tabs but if you don’t you can always add a few drops of eucalyptus oil to each to increase that scent. One day when I was feeling particularly bad I used 3 of these guys in one day spreading them out through the day. Come tab #3 my skin was feeling so dry so instead of placing it in the shower I placed it in a tiny little bowl with just a trace of water in the bottom. Adding water as needed this guy did big things for me while I sat on the bed. It wasn’t as helpful as the scent in addition to steam, which can be helpful on it’s own, but it did give me enough relief that I have done this a few times again.